Lauren + Jeff are members at Midtown Athletic Club. For those that don’t know, Midtown has been a Chicago tennis club for decades. They recently expanded their facility to include state of the art fitness and athletic training facilities! They also built an amazing modern boutique hotel with a rooftop deck! Lauren + Jeff had the vision and foresight to ask about having their wedding at this new facility! The result: THEY WERE THE FIRST WEDDING AT THE HOTEL AT MIDTOWN CHICAGO! 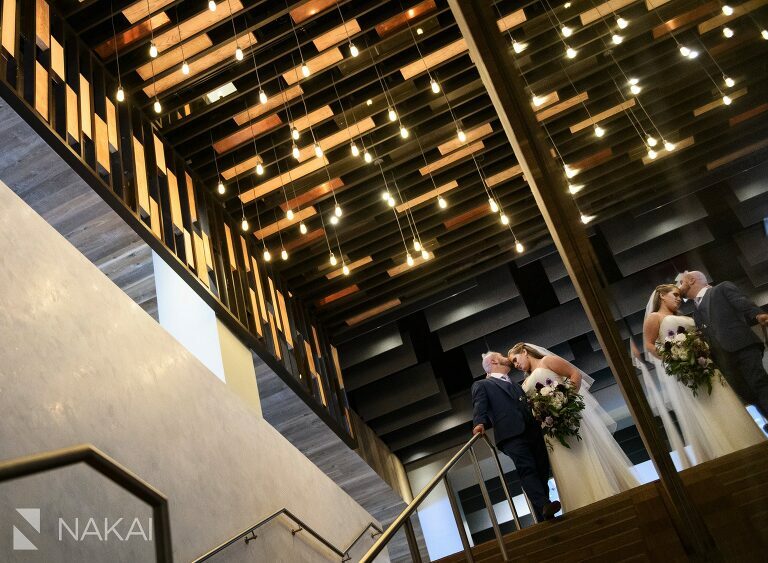 As a wedding photographer, I love shooting in new venues, and The Hotel at Midtown Chicago is no exception! The view of the Chicago skyline from their rooftop is unreal! In case you missed it, be sure to check out their Chicago Engagement Photos too! The lobby at Midtown Chicago has the most amazing decor, including this staircase! 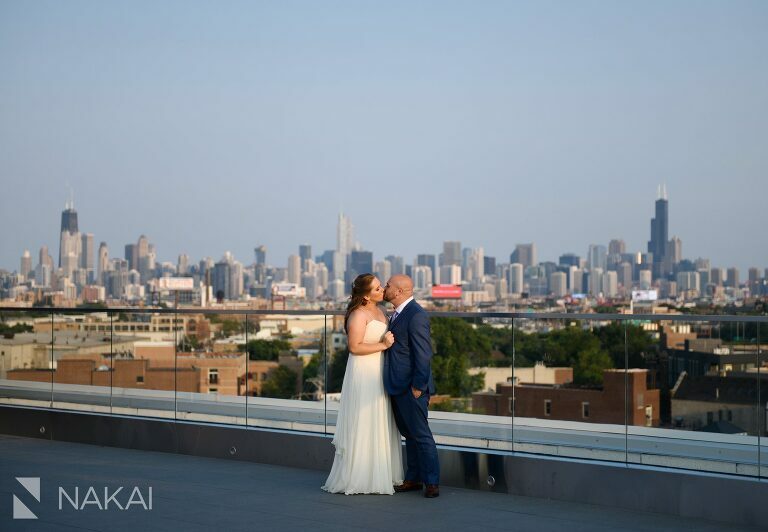 A kiss on the rooftop of The Hotel at Midtown Chicago – with our iconic skyline in the background! The rooftop all set up for the reception. Guests were treated to a gorgeous sunset while they ate dinner! A picture of her wedding gown hanging in the penthouse suite! I love that you can see the Chicago skyline in the background! And then there were these custom Jimmy Choo shoes. Custom color with an engraved date on the bottom! The custom engraved bottom only available at official Jimmy Choo stores! Love this portrait of Lauren! I love the strong modern lines on the exterior of Midtown juxtaposed with their smiles and pose! Lauren + Jeff wanted to head downtown to get a few photos with the Chicago skyline! There’s always one in the group. Jeff loves the classic architecture of the Field Museum, so we made sure to stop by for a few quick pictures! Photographers Tip: When you see good symmentry, you have to shoot it! The last stop was in front of the Chicago Theatre sign! The Hotel at Midtown Chicago all ready for the first wedding ceremony on their rooftop! Photographer’s Tip: Sense of place – when possible, include landmarks to help the viewer know where the photo was taken! Here you can see the Willis Tower in the background! One of those moments that happens in a blink of an eye! One of the surprises of the night – when Jeff took out his guitar and led the band in a couple of songs! Thank you Lauren + Jeff for having me as your wedding photographer! It was an unforgettable night at Midtown Chicago – the most perfect evening for a rooftop wedding reception! Can’t wait to show you more! « Armour House Wedding Photographer Teasers! Sylvia + Billy!